Summary: Researchers have developed a new robotic learning system, called visual foresight, that allows robots to predict a series of movements they must perform in order to manipulate objects. 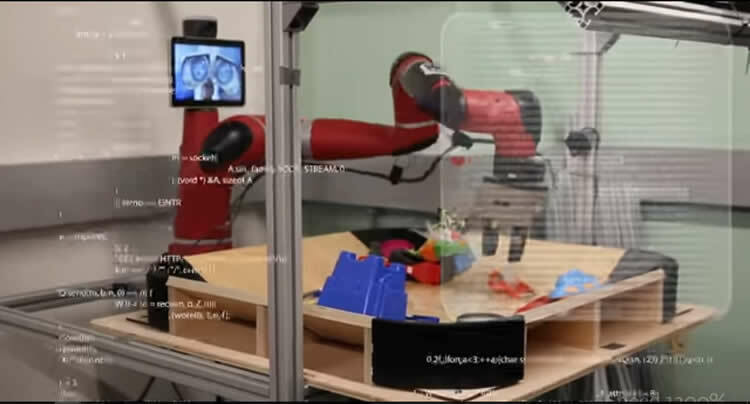 With the new technology, a robot pushes objects on a table, then uses the learned prediction model to choose motions that will move an object to a desired location. Robots use the learned model from raw camera observations to teach themselves how to avoid obstacles and push objects around obstructions. NeuroscienceNews.com image is adapted from the UC Berkeley video. Image Source: NeuroscienceNews.com image is adapted from the UC Berkeley video. Video Source: Video credited to UC Berkeley. Original Research: The findings were presented at Neural Information Processing Systems conference. UC Berkeley “New Robots Can See Into Their Future.” NeuroscienceNews. NeuroscienceNews, 14 December 2017. UC Berkeley “New Robots Can See Into Their Future.” http://neurosciencenews.com/robotic-future-learning-8190/ (accessed December 14, 2017).